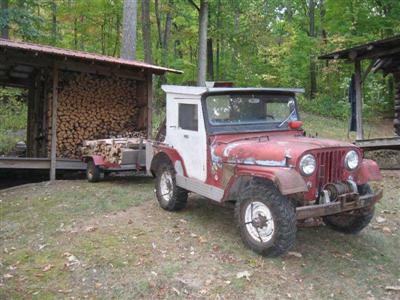 I bought a 1964 CJ5 in 1976. It already had a 225 Dauntless V6 installed, but was original otherwise. It also has a Koenig PTO winch. Larry's Comment: Jay...you are using your Jeep for what it was intended...and then some! We often forget that Jeeps were most often designed and used as tools to accomplish work tasks to help support ourselves and our families. I like your pioneer spirit! Jay's Jeep (aka as my dad's Jeep) is an amazing machine! It's a few years older than I am and I don't remember life without it. When I was a little little kid Dad installed a middle seat for me that I adored; in my grade-school years I fondly remember it taking us to the creek for swimming in the summer and up the mountain for hot-dog roasts in the fall; when I was a teenager it was the first thing I drove. But nothing was so cool as watching Dad convert that machine into a crane as he built his dream log cabin. Cheers to Old Red! !